Most bearing failures are a result of inadequate lubrication. Over or under-lubricating can shorten the life of your bearings resulting in production downtime. It is important not only to know the proper lubricant for each application, but to keep accurate lubricant levels in your bearings. Proper lubrication not only keeps your equipment running smoothly, but also keeps contaminants out. 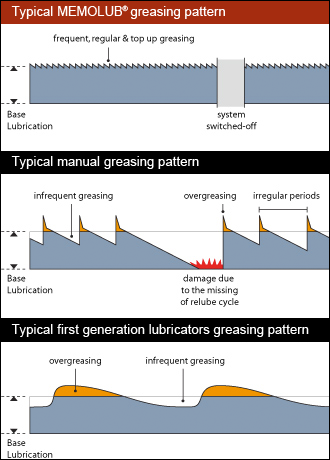 Manual lubrication, when done correctly can show good results. But in today's industry, inaccessibility to lube points and a higher demand and cost of maintenance personnel, proper lubrication can fall victim to neglect. The best preventive maintenance practice is to consistently apply a metered amount of lubricant to the bearing over a defined period of time. This can be achieved with automatic lubrication. Automatic lubrication systems have become the cost-effective and economical choice to reliable lubrication. Having control over this process is where MEMOLUB® can help. The MEMOLUB® has become a trusted name in Controlled Automatic Lubrication. Download our Sound Money Decisions analysis worksheet for further savings.